FISHKILL (Dutchess County)—Scenic Hudson has conserved 30 acres in the Hudson Highlands that ensure the protection of world-class vistas enjoyed from the Newburgh-Beacon Bridge, the Hudson River, trails in adjacent Hudson Highlands State Park Preserve and the Newburgh waterfront. The transaction marks another victory in Scenic Hudson’s ongoing Saving the Land That Matters Most campaign. Scenic Hudson has been working to protect the wooded property—the most visually significant inholding on the western slope of Fishkill Ridge—for more than a decade. In addition to providing a scenic buffer for trails within the popular state park, the transaction offers the potential to create new trails that would afford seasonal views and connections to other trails along the ridge. It also preserves the contiguity and health of the broader forested landscape within the Hudson Highlands that furnishes habitat for a multitude of species. Scenic Hudson Senior Land Project Manager Matt Shipkey negotiated the transaction. Scenic Hudson’s acquisition was completed with funds from its Lila Acheson and DeWitt Wallace Hudson Valley Land Preservation Endowment. Scenic Hudson purchased the property from Matthew Ciccone. “Fishkill Ridge is one of the Hudson Valley’s iconic landscapes, visible from miles around and offering the public some of the best hiking in the region. Throughout the year, people come from New York City and all over to enjoy this remarkable resource, in turn contributing to the economic vitality of nearby communities such as Fishkill, Beacon and Cold Spring. We are delighted to achieve our goal of protecting this property,” said Steve Rosenberg, executive director of The Scenic Hudson Land Trust. Scenic Hudson has protected more than 1,300 acres along Fishkill Ridge, facilitating creation of 11.5 miles of challenging wilderness trails that allow visitors to walk beside a stream to a waterfall, scramble up rocks and step onto outcroppings affording some of the most breathtaking long-range vistas in the Hudson Highlands. In 2013 the New York State Office of Parks, Recreation and Historic Preservation acquired nearly 1,250 acres of this open space for inclusion within Hudson Highlands State Park. 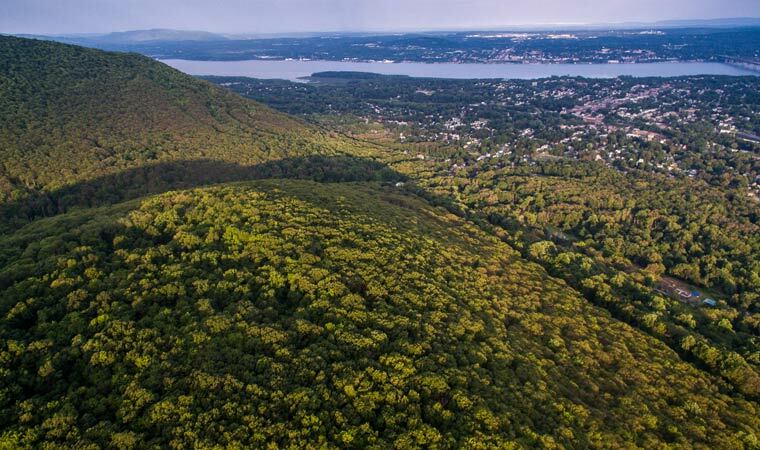 Scenic Hudson pursues its campaign to Save the Land That Matters Most realizing that preserving land provides the cornerstone of a sustainable Hudson Valley economy. Tourism in the 10-county region sustains more than 83,000 jobs. Annual tourism spending in Dutchess County is $509 million and supports more than 9,500 jobs. Protected lands also help grow other parts of the economy. A study by the Trust for Public Land notes that executives looking to relocate or start firms rank quality of life—including an abundance of parks and open space—higher than housing, cost of living and good schools. Scenic Hudson’s campaign to Save the Land That Matters Most is a multi-year, collaborative effort with fellow land trusts, governments, individuals and businesses to protect lands of the highest scenic, ecological and agricultural significance throughout the Hudson Valley. Since initiating the campaign in 2007, Scenic Hudson has conserved 14,113 acres and our land trust partners an additional 2,669 acres.